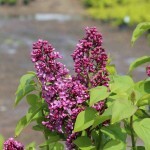 Large shrub with intense, dark red-violet buds that open to lighter hued single flowers in mid spring. While fragrant, it is more subtle than some other cultivars. Another old cultivar that has retained popularity. It prefers full sun and a well-drained soil. Prune after flowering to encourage next years blooms.